The NUUO Titan NT-8040RP is a rack-mount network video recorder that uses an embedded Linux operating system. The Titan NT-8040RP is designed for higher end video surveillance applications that require a lot of bandwidth throughput for multiple megapixel IP cameras. Maximum throughput of the NUUO Titan is 250 Mbps which allows support of up to 64 5-Megapixel cameras at 7-10 frames per second with moderate activity. A 4 camera license is included with the NVR Titan and can be easily upgraded during the initial build or after sale by adding additional IP camera licenses. Additional channels can be purchased in increments of 1, 4, 8, 12, 16, 25, and 32 camera licenses. The Titan NT-8040RP is powered by a 400 Watt Redundant Power Supply, meaning that it has two power units inside it. Each power unit is capable of powering the unit on it's own and if one fails, the other seamlessly switches on so that power is not interrupted. The NT-8040RP is enclosed in a 2U rack-mount case. Titan NVRs are also available as desktop stand-alone NVR and 1U rack-mount NVR. The NVR Titan has 8 hard drive bays that support up to 3TB SATA II hard drives for a total of 24 Terabytes. For use with multiple hard drives, RAID 0, 1, 5, and 10 disk configurations are supported by the operating system. 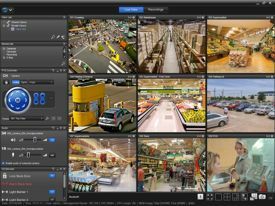 The NUUO NVR Titan includes Windows and Mac client surveillance software that lets you control all of the DVR operations of the recorder including, live viewing, recorded video playback, and complete configuration. After the NVR Titan is accessible on your network, you can control all operations from Windows and Macintosh computers. You will be able to access from the LAN (local area network) or remotely over the Internet (WAN).